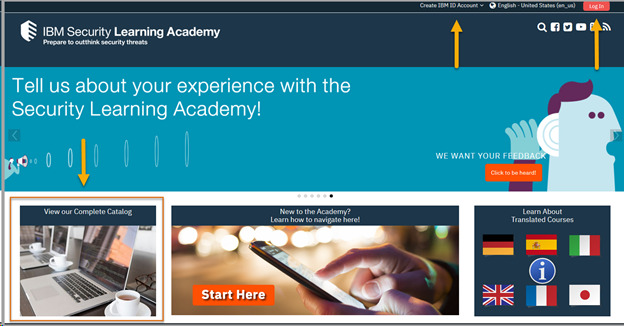 Did you know that the IBM Security Learning Academy has free training available to IBM customers, IBM Business Partners, and IBMers on MaaS360 and the entire IBM Security portfolio of products? All you need to enroll in our courses is an IBMid. Don’t have an IBMid? Don’t worry, you’ll be prompted to create one when you log in. And, if you’re just looking for short how to task based videos, you don’t even need to enroll. SaaS offerings, such as MaaS360, are constantly changing to meet our customer and IBM Business Partner needs. The mobile landscape is also changing every day. That’s why on the IBM Security Learning Academy, we have comprehensive courses to get you up to speed on the core components of our MaaS360 unified endpoint management (UEM) solution, as well as just in time how to videos, and Ongoing Product Education to keep you up-to-date on the most recent releases. Let’s review some of the different training options available to you! In the upper right, log in to the academy with your IBM ID. If you don’t have one, click Create an IBMid account. You only need to enter your name, email, and a strong password. Next, click View our Complete Catalog and you’ll get a list of all our IBM Security products and solutions. You can search for the topic you need using the Search Courses field. Otherwise, just click the Mobile Security: IBM MaaS360 tile to see the full portfolio of MaaS360 training. At first glance, you'll see the MaaS360 has 80+ training assets that cover MaaS360 foundations, integrations, and system product integration. You'll also find 90+ short how-to task-based videos on platform, integration, and device topics. In the upper right, you can search all MaaS360 courses by a topic, such as Cloud Extender. MaaS360 Ongoing Product Education is just-in-time content that changes rapidly based on new releases and upcoming events. You’ll want to check back often. On the lower half of the page, you have the option of training paths, comprehensives courses, hands on labs, and how-to videos. So where to start? If you want a guided learning path based on your role, select the IBM MaaS360 Training Roadmaps. Several are available: Administrator, Business Partner Administrator, Deployment Professional, Help Desk, Business Partner Help Desk, Integration Professional, and Trial Customer. Here is an example of a training path for a customer help desk administrator. Note there are video courses, hands on labs, and you can also take a quiz when completed, to receive an IBM skills badge. Click the first course to enroll and begin the training path. 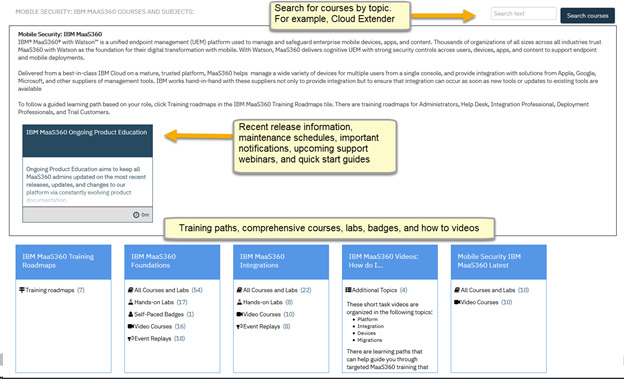 You can also review courses by clicking each tile – Foundations, Integrations, and How-to Videos. Courses are categorized by whether they include a hands-on lab, video only, badges, or event replays. The event replays were hosted by MaaS360 subject matter experts and usually run about an hour. 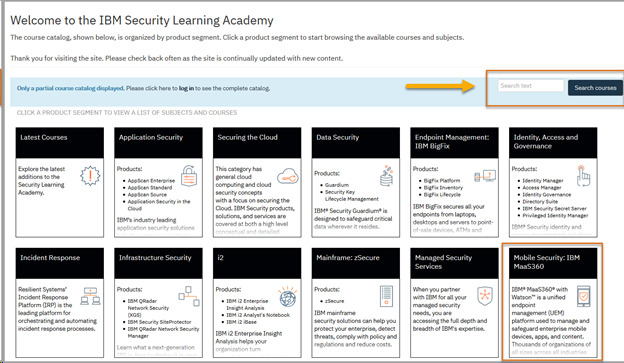 To ensure that MaaS360 admins can keep up with the fast pace of change, we have created the MaaS360 Ongoing Product Education curriculum on the Security Learning Academy. You can access release notes, quick reference guides, important notifications (including maintenance schedules), upcoming technical webinars, and important information. Click the MaaS360 Ongoing Product Education tile.